Luckily, an Asian Bistro with Elegant Flair, and Right on the Strip! For the ultimate in gastronomic experiences in Las Vegas, look no further than the Wynn. With something for everyone, Steve Wynn has created a culinary discovery of enviable proportions, and right on the Las Vegas strip. One of those dynamic dining experiences is Red 8, a casually elegant Asian bistro that features Malaysian, Cantonese, Hong Kong, Thai and Indonesian cuisine to perfection. Situated right on the casino floor, near the high-roller and baccarat rooms, Red 8 not only provides you with an exploration in flavor, but you also get the entertainment of watching the excitement in the casino, and at no extra charge! If you plan on dining at Red 8 just remember that the restaurant is popular and doesn't take reservations. 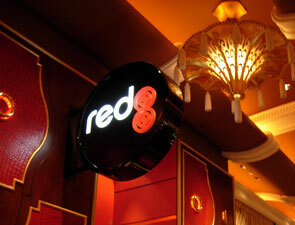 We suggest that you plan for Red 8 on a day when you can play at the Wynn and watch for a table at the restaurant. Reservations: They accept walk-ins only, no reservations are taken. If you have a question about the restaurant, you can reach them through their direct line: (702) 770-3380.